fine for all radios tested. A 6809 adapter manufactured by MMS, Inc. here in Tucson was successfully interfaced to the TNC, replacing the 6502. This modification allows the Alpha boards (made so long ago) to use the same code being developed for the Beta boards. Although the Alpha test has given boards that work talking to each other over the air, no test protocol has yet been written to test them in a NETWORK configuration. So the Hardware group is temporarily playing software group as well, coming up with both the TNC interrupt drivers for all of the on-board I.C. 's (less the parallel port, for Alpha), and sufficient assembler code to operate with Lyle's two VADCG boards, one using the AMRAD repeater protocol, and the other acting as another station on the net. This gives us both a good test of all software, and a proper test of compatibility with all of the VADCG boards already out in the field. Our coordination efforts within TAPR have been horrendous, with close to 180 members in over 25 states and four countries as of this writing. We have been simply inundated with requests for information, and have not only missed some of those requests, but have messed up getting information out to our own members! Although we're doing what we can to keep outsiders informed, I would urge anyone with an interest in what TAPR is doing to become a member for just one year, at $12. The President's office has just taken over handling requests, complaints etc., and will be very responsive to other people's needs. 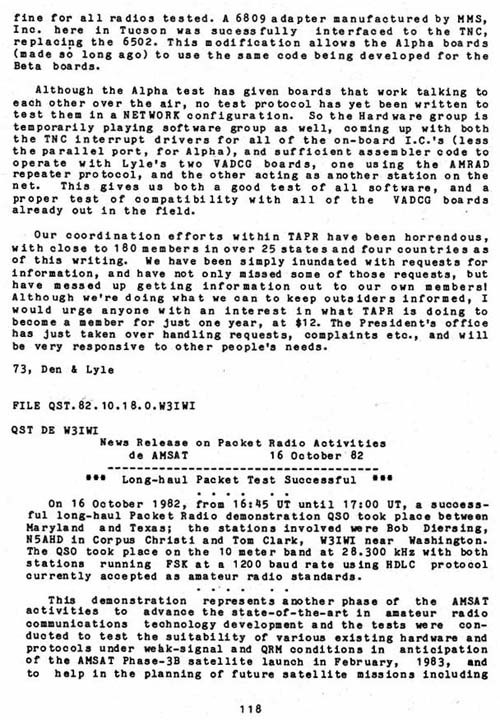 On 16 October 1982, from 16:45 UT until 17:00 UT, a successful long-haul Packet Radio demonstration QSO took place between Maryland and Texas; the stations involved were Bob Diersing, N5AHD in Corpus Christi and Tom Clark, W3IWI near Washington. The QSO took place on the 10 meter band at 28.300 kHz with both stations running FSK at a 1200 baud rate using HDLC protocol currently accepted as amateur radio standards.